This entry was posted on Tuesday, June 23rd, 2009 at 5:15 am and is filed under Photography. You can follow any responses to this entry through the RSS 2.0 feed. You can leave a response, or trackback from your own site. Kes Te’ubo is a local administrator and a scribe/illustrator in Lalibela. He makes wonderful, vivid colors out of powdered natural materials, mainly flower petals, roots, and leaves. 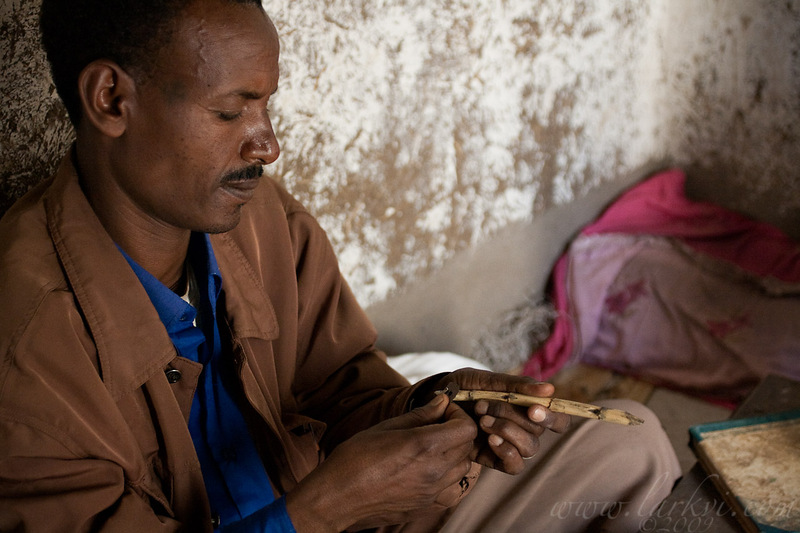 Here, he is demonstrating his pen-cutting technique on a piece of native bamboo, known as ‘shamboko,’ which is the primary material used for traditional pens in Ethiopia (some other materials are mainly used for magical writing, and there is a tradition that quills were also used in the past. Interviewing Te’ubo was interesting, as he was arrested on false charges between two of our meetings and thrown into the local lock-up. It was the first time I visited a jail in Ethiopia, though it was the temporary local jail, and not the prison proper. He was let out later that day, and the charges were apparently thrown out by the magistrate, but I briefly thought I would have to finish the interviews in prison.